Life with the P's | A young couple living life – remodeling, diy projects, and everything in between! Deep down, we really just didn’t like it at all. So, during Aaron’s parent’s most recent visit, we all got tired of looking at it and decided to re-do it yet again. Don’t laugh – yes, it actually sat like that for almost a year. The spiral staircase definitely looked odd without any handrail. In our defense, there were soooo many things wrong with the original deck. 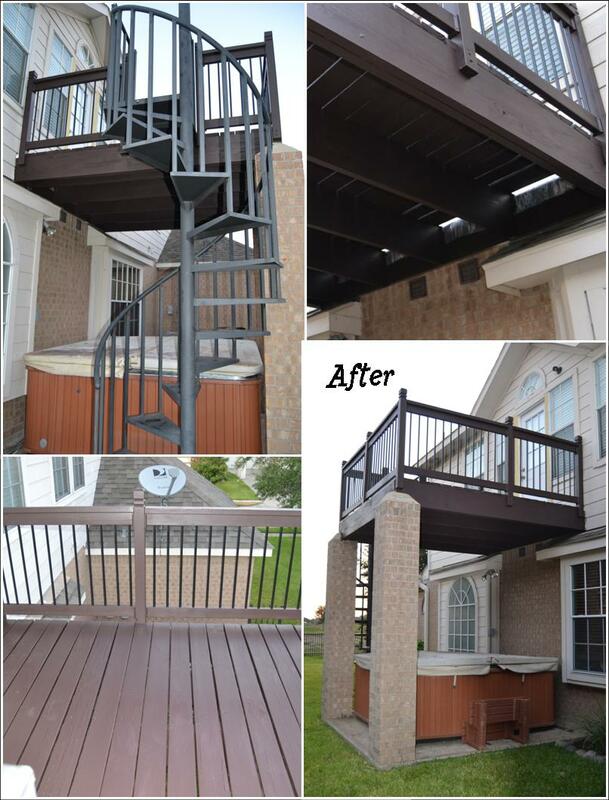 The deck was installed after the house was built and wasn’t planned well. The original baluster posts were screwed the the house and attached to the deck improperly. There wasn’t any flashing between the deck and the house, which caused water to run into the office on the first floor (we fixed that quickly as it was causing some problems with the drywall). I can’t even remember the rest, but it was a fairly long list of problems. The hot tub came with house. It was obviously barely used, but the hot tub cover is absolutely destroyed and needs to be replaced, like, yesterday. 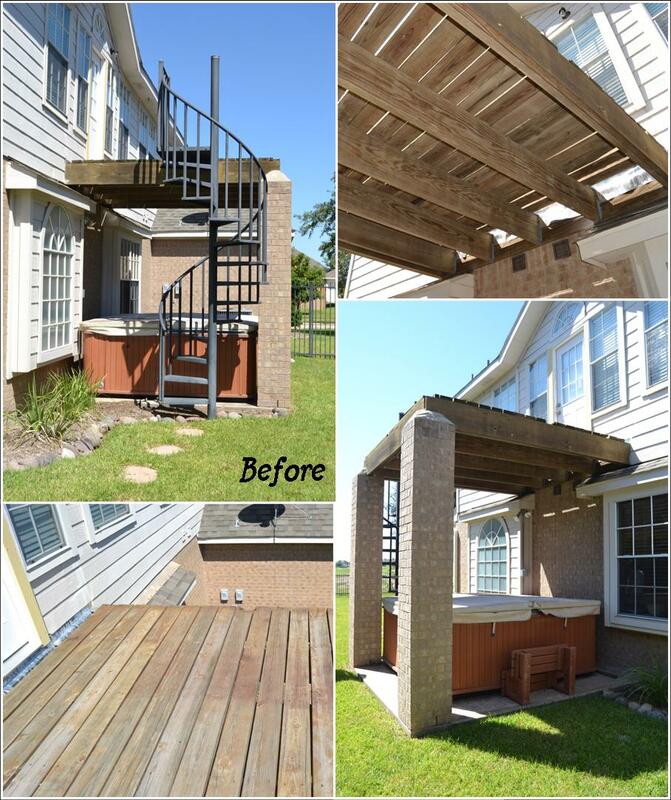 We have been holding off because we figured staining the deck above it would make a mess. Since is it now “fall” in Texas, we are prepping ourselves for hot tub season. Since the deck is finished, we can now buy a hot tub cover and fire that bad boy up! Also, we want to buy some nice screens to hang from the deck to surround the hot tub for privacy and shade. We are also debating painting the hot tub sides. The color just doesn’t blend well with the house, especially after looking at the pictures. Maybe we can do that when we run out of major projects and are bored (haha… like that will ever happen!). 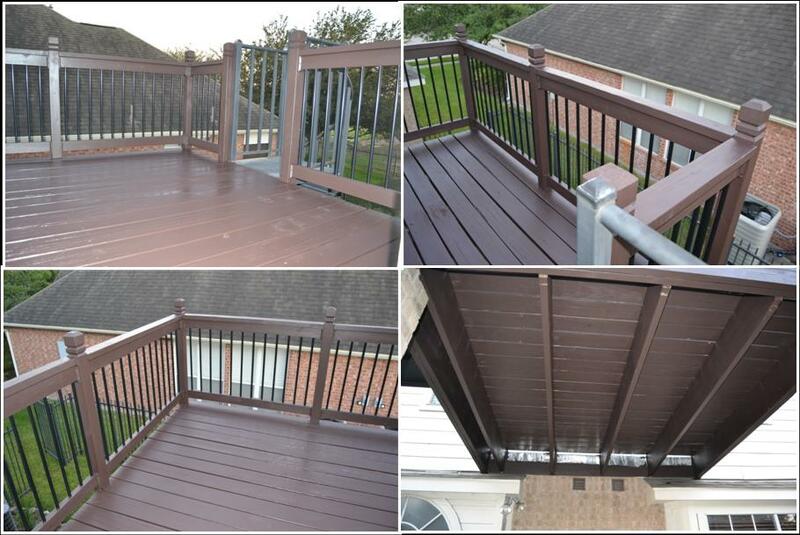 As with the entire house, this area isn’t completely finished yet, but at least the deck is done!! You can thank Homestyler for that! I now know what I will be using to design my sweet pool and backyard!!!! 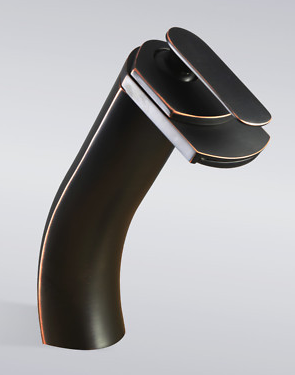 Anyway, enough of being excited about this AWESOME new design tool I googled-upon! 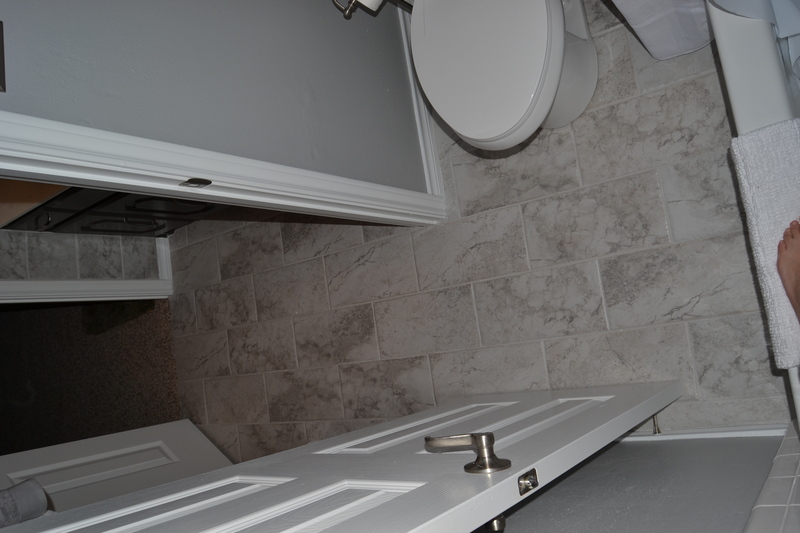 The bathroom is accessible from 2 of the 3 bedrooms upstairs. However, it only has one sink that is 55″ long. We debated changing it to a double bowl vanity, but it would be fairly difficult and not really worth the hassle. Moving on to the before bathroom shots (I couldn’t even get a picture before Aaron already started demo and the mirror was gone. Yes, we had that wallpaper in the bathroom before. And the shower tile is UGLY but, we figured we would work with it since it looks like this bathtub was never ever used. So our plan was to do a marble/grey theme in this bathroom. In short – WE NAILED IT! This is my favorite bathroom. I can’t wait to re-do our master in hopes that it turns out as awesome as this one. First thing we did was demo everything. We carefully removed the counter top and donated to Habitat for Humanity Re-store. The linoleum was super easy to remove (still baffled by the fact that this house had linoleum but I guess we should be grateful since it is insanely easy to remove). Next up was painting the vanity. 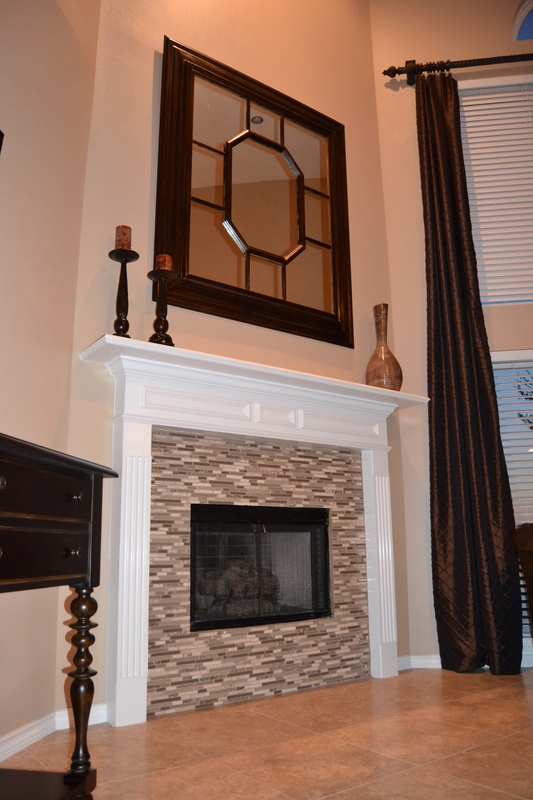 We chose the color Black Fox by Sherwin Williams. It blends perfectly with the tile. I was shooting for a black/grey with a nice brown tint. It didn’t really turn out the way I had planned. Instead, I think I like it more than if it had turned out how I originally intended. We also added some in-stock and inexpensive cabinet hardware from Lowe’s. We decided to change the lighting in the room from a single bar light above the mirror to two sconce lights on each side of the mirror and also added a can light. Since this bathroom is on the second floor, it was easy (but very HOT) to access the ceiling through the attic. Adding the can light made it a lot brighter in the bathroom and was definitely a much needed improvement. For the sconce lights, we chose Hampton Bay’s Sadie Wall Sconce (on sale at our Home Depot for $19.99 when we bought them). In the shower and toilet part of the bathroom, we updated the light from a $5 acorn shaped light to a nice looking pendant light. The light has grey and white swirls and really looks great. 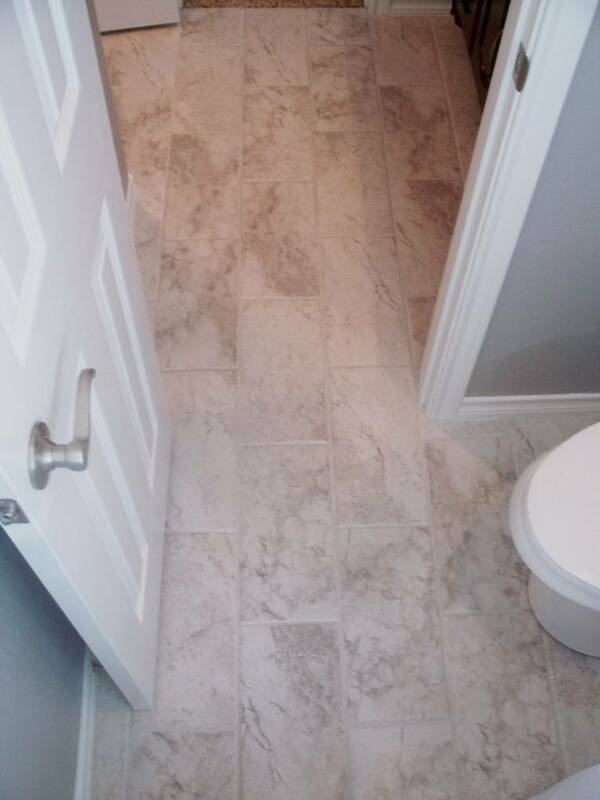 First of all, real marble is EXPENSIVE so we cheated and used some ceramic tile that somewhat resembled marble. 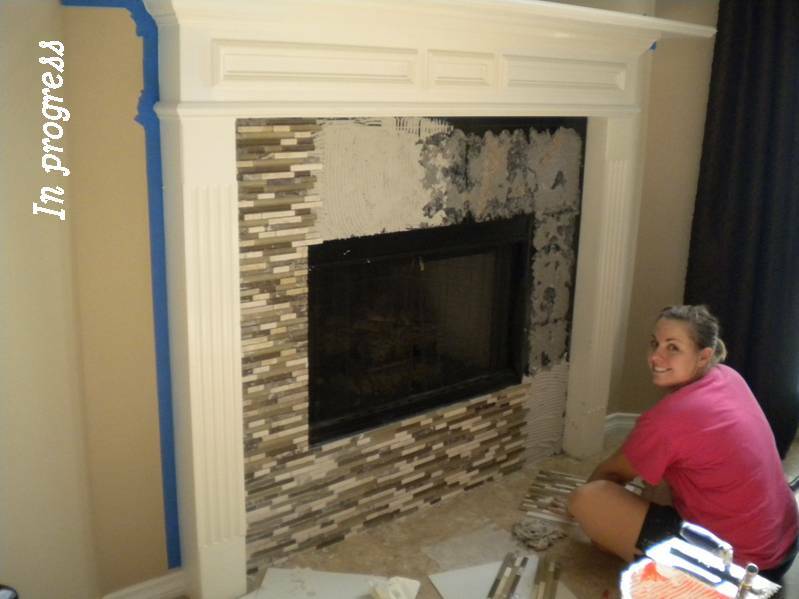 We bought some mosaic marble tile and marble tile borders for accents. 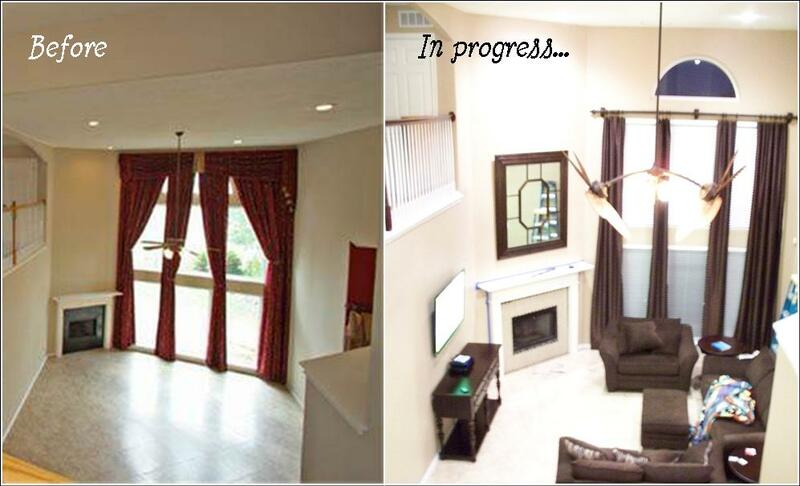 Below is a progress picture of our accent sections when we installed them. We couldn’t tile the rest of the wall until the counter arrived, so it was a good idea to get this out of the way. We used finishing nails to hold the tile in place until it the mortar was set. There is an excellent granite place that I found that isn’t too far away from our house. 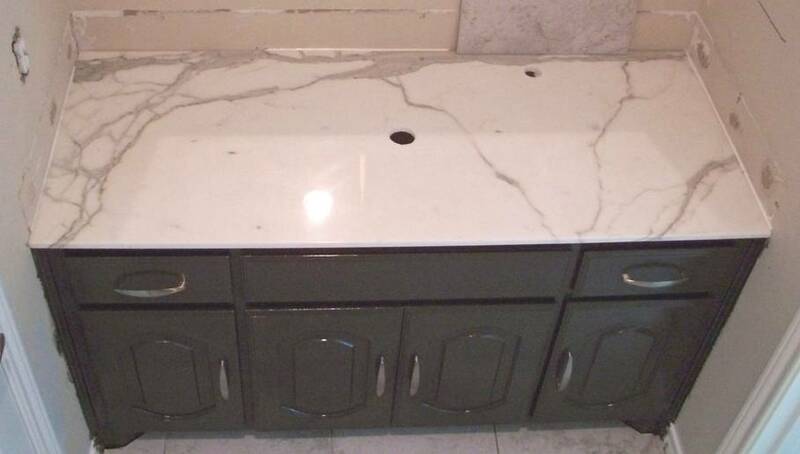 I called and the guy said they had a piece of marble and that he would do a 55″ vanity with a vessel bowl cut out (read about our vessel bowl drama here) for $450 (and deliver it for that price!). This was a steal compared to everywhere else we looked/called. 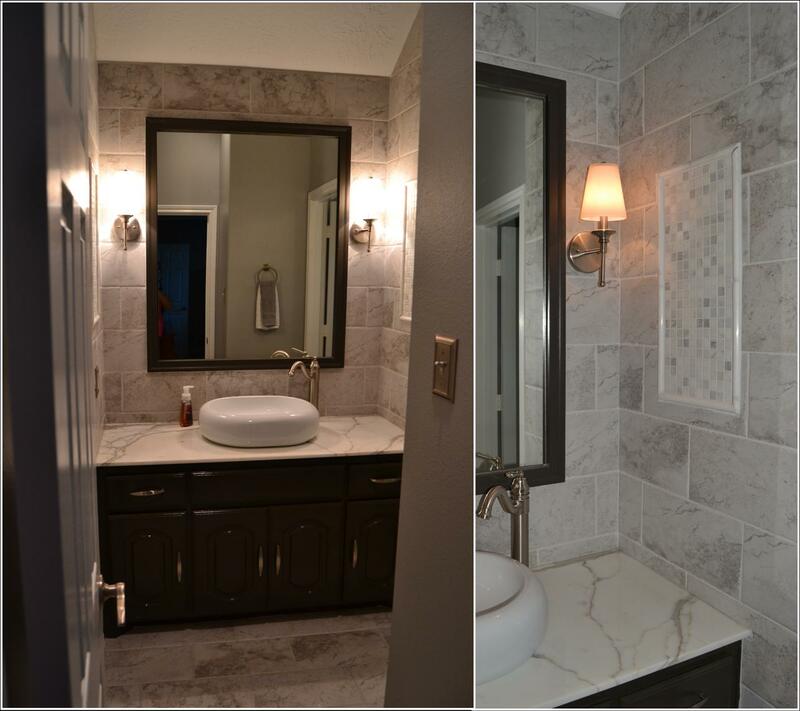 Most granite places required that we buy the ENTIRE slab of marble/granite and Lowe’s cheapest vanity top that was a comparable color was in the $900 range. By this point, we were into this grey marble stuff waaaaay too deep to not get the vanity top that was just perfect. Aaron and I both had a vision of what we wanted and we lucked out with this counter top guy because he had a perfect piece! And he didn’t care that we wanted to install it ourselves to save some $$$. 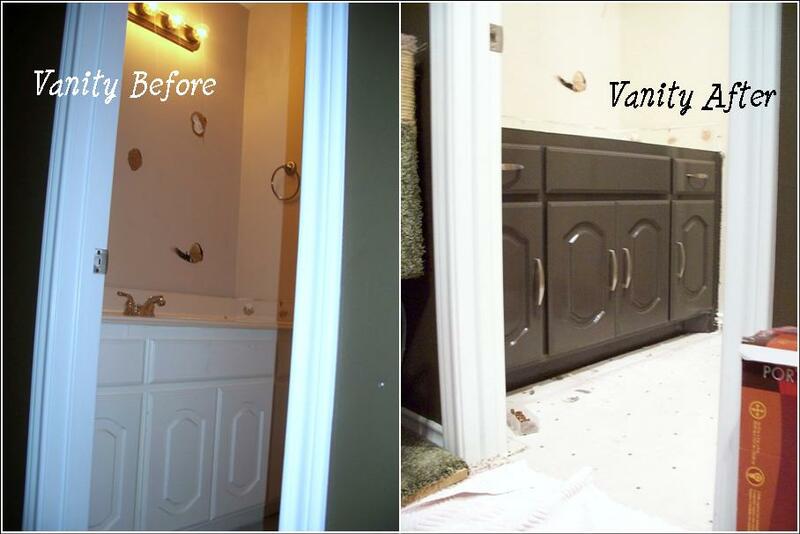 We will definitely be returning to him for the master bathroom remodel! Anyway, the vanity top took about 10 days and it was delivered. It is more than perfect. I am so in love with that large veined marble!!!!!!!! There are a couple of additional items that were purchased/added that weren’t mentioned above. 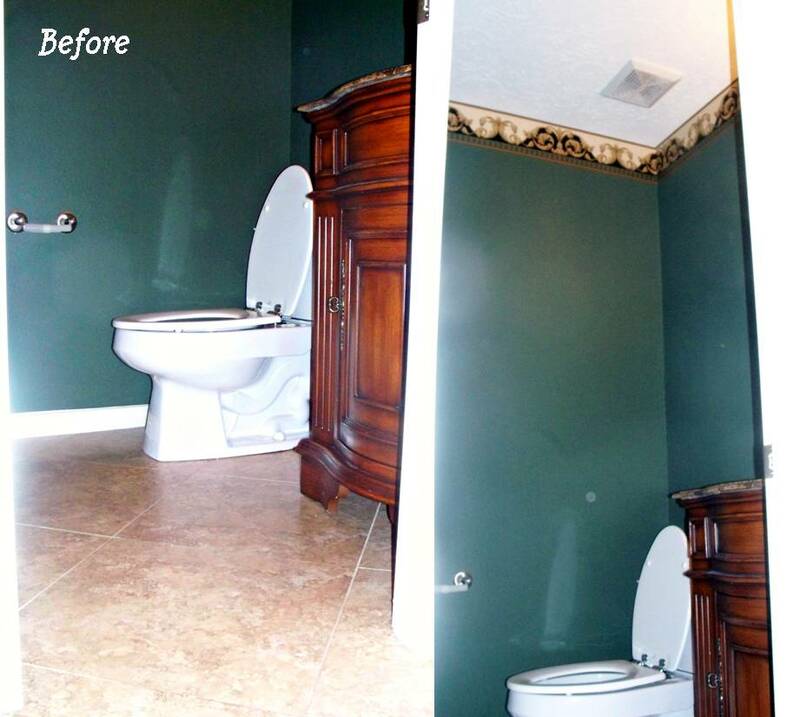 We bought a new toilet for this bathroom after failed attempts to clean the old one. The house sat for 12-18 months before we bought it and as a result, all of the toilets have had rings in them where the water sat (ew). Also, we purchased a curved shower curtain rod and an extra long (84″) shower curtain. Advice: if you are going to have an extra long shower curtain, buy the curtain and plan the bathroom around it. It is almost impossible to find the shower curtain you like in extra long. We almost sewed our own- that is how much trouble we had finding one. Instead, we bought a plain white waffle weave shower curtain from Bed Bath & Beyond that you can find here. 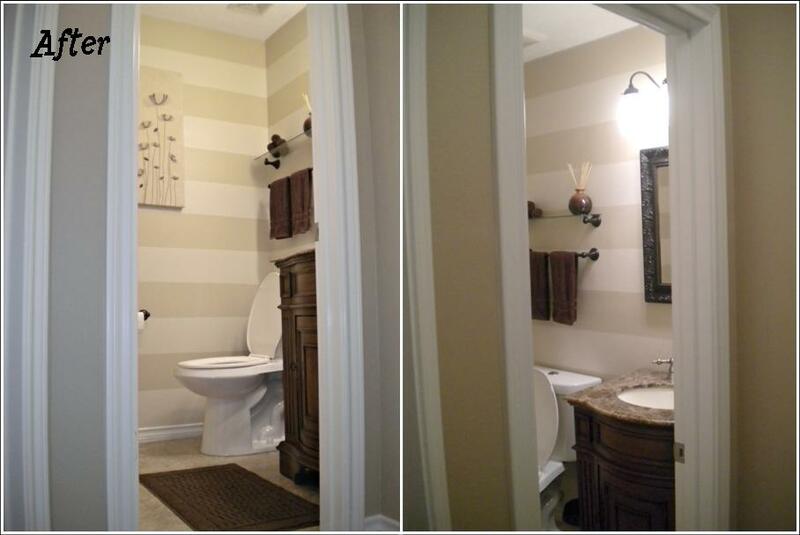 And that’s it for this bathroom… I LOVE IT! 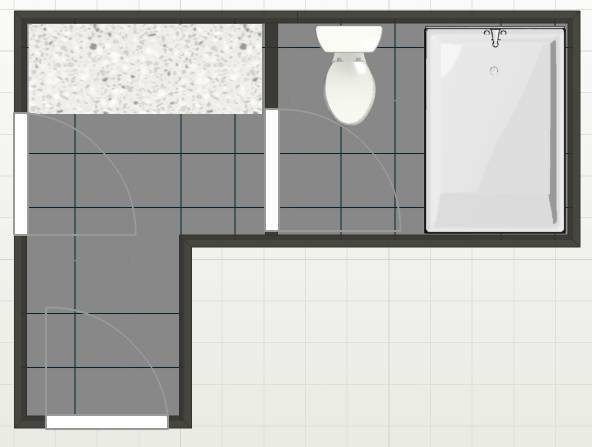 I already warned Aaron that if the master bathroom remodel doesn’t impress me more than this bathroom, I will be moving upstairs and taking over this bathroom. haha! A third bathroom in our house is now complete! I got a wild hair and wanted to re-do this bathroom a couple of weekends ago. 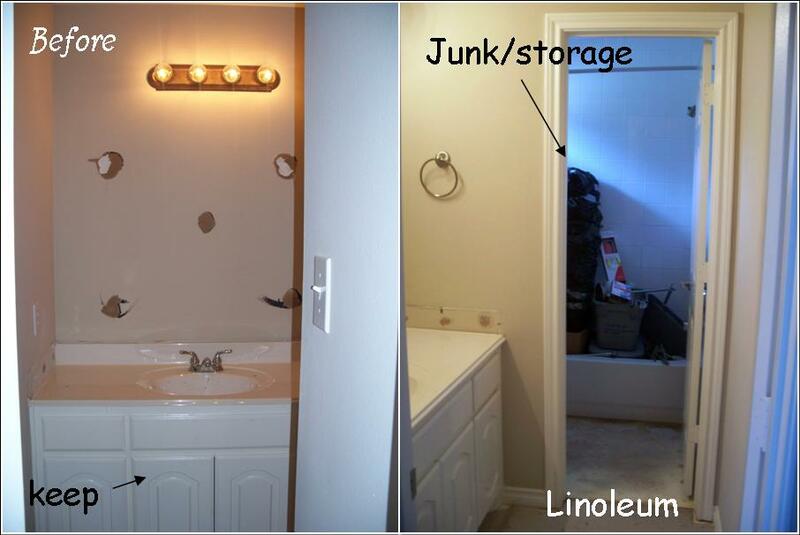 I was pretty proud of myself for removing the toilet and vanity all by myself. I even had to take the door off the hinges in order to fit the vanity through it. But Aaron was busy on the car and I handled it all! This is the primary bathroom that everyone uses when they visit and it is downright embarrassing. Or, at least it was. Lucky for us that the previous owners upgraded to this lovely granite vanity. I know that they upgraded because I could see the outline of where the old pedestal sink used to be after I had removed the current sink for painting. The “new” vanity is the only thing, and I mean only thing this bathroom had going for it. It took me 4-5 hours just to prep for painting. The wax ring on the toilet was bad, so the area around the toilet was nasty (thankfully we are on a slab foundation, so no harm done by the bad wax ring). I also scrubbed the trim, especially where it meets the walls so that paint could better adhere to it. Next, I removed the exhaust fan cover and the vent and scrubbed both of those (yuck). I also removed the light fixture and wired a temp light. Finally I was ready to paint the ceiling. Faucet – to be replaced at a later date for under $50 (thanks EBAY! ), or maybe spray painted for less… jury is still out on this one. 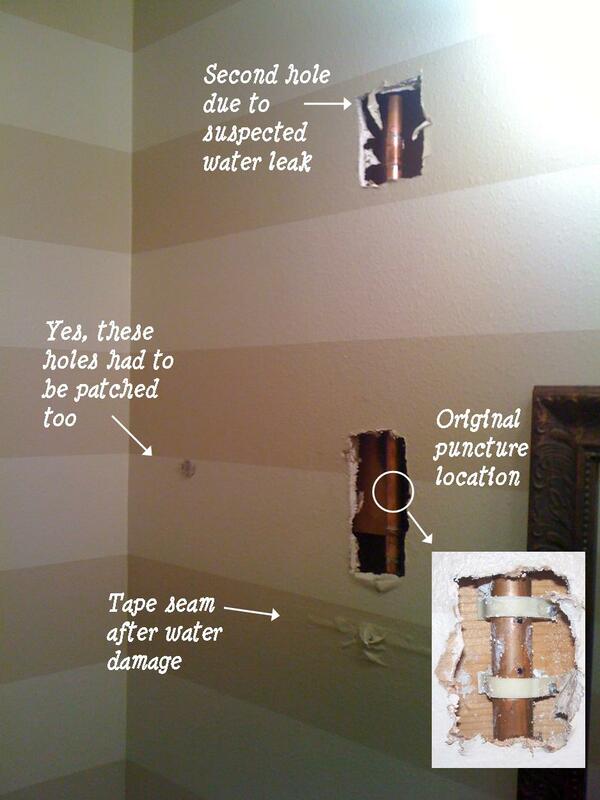 The reason for the second hole higher up on the wall is that the solder didn’t take on the first attempt and the water had so much pressure that it looked like it could be leaking higher up in the wall. We didn’t want to take any chances because it was feasible that we had created a leak somewhere else after all the stress we put on the pipe trying to cut out the screwed (haha) section. Needless to say, I was very depressed and disappointed. And I despise drywall, so that just made the sinking feeling even worse. Oh well, I sucked it up and patched and re-painted the wall. This project took about 6 days total from start to finish (although, 4 days were spent waiting for the coats of drywall compound to dry). And lets just say lesson learned… on the master bathroom, we will determine where the towel bars go before paint/tiling the walls. Paint from the top down. This seems fairly obvious, but I have tried to avoid it before. 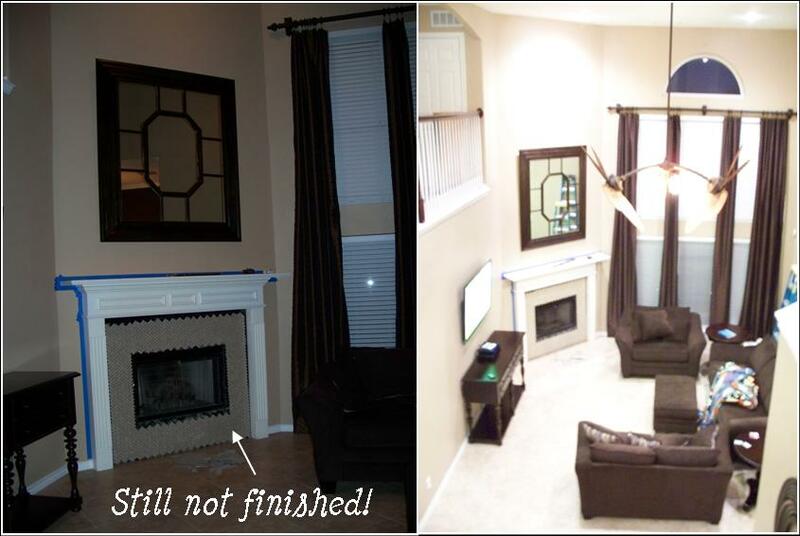 We have been painting entire rooms – ceilings, walls, and trim/doors. I start with the ceiling first, then the walls, and then I tape of the walls to paint the trim. If I mess up this order in any way, I end up splattering paint from the ceiling on the freshly painted walls or from the walls onto the freshly painted trim. Cut in with a brush wherever possible, especially along the ceilings. I use an 1 ½” to 2” angled brush to cut in. I didn’t use to cut in the ceiling by hand and I always had bleed through and runs behind the tape. I also typically paint about 6” down the wall with a brush to avoid hitting the ceiling with the roller. It is most disappointing when this happens and best to avoid it all together. Below is a picture of how I cut in while I was painting coat #2 of the same color. It is goo to have paint on the bottom half of your paint brush and start low and work your way up to the ceiling. Run a smooth line along the ceiling until you start to run out of paint. 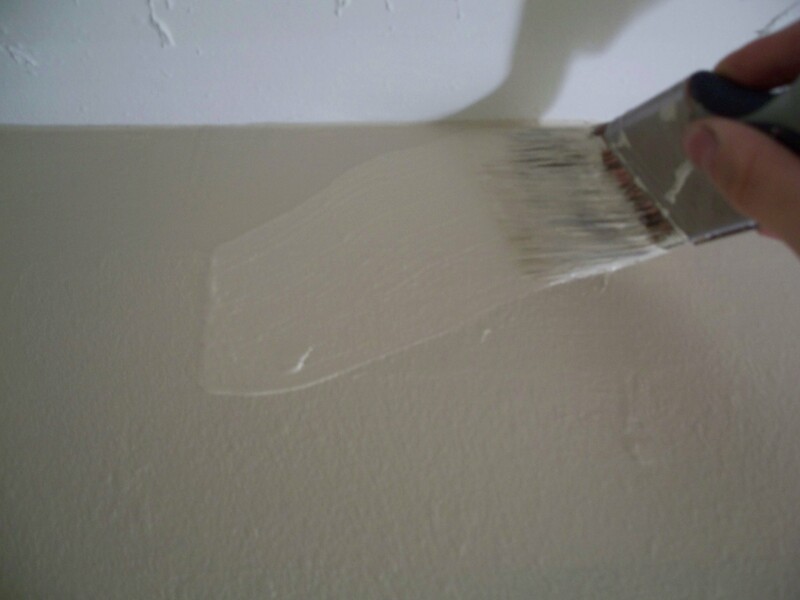 Then smooth out the paint below the ceiling line so that it doesn’t run and so that you get that 6″ or so of painted wall. I usually make about a 6-8″ line each time before I have to refill my paint brush. Color requires 2 coats, minimum. I prefer to buy the cheaper paint because of this. I have found that no matter what color it is, it always requires two coats. I have been able to get away with only one coat of paint on one surface – the ceilings. 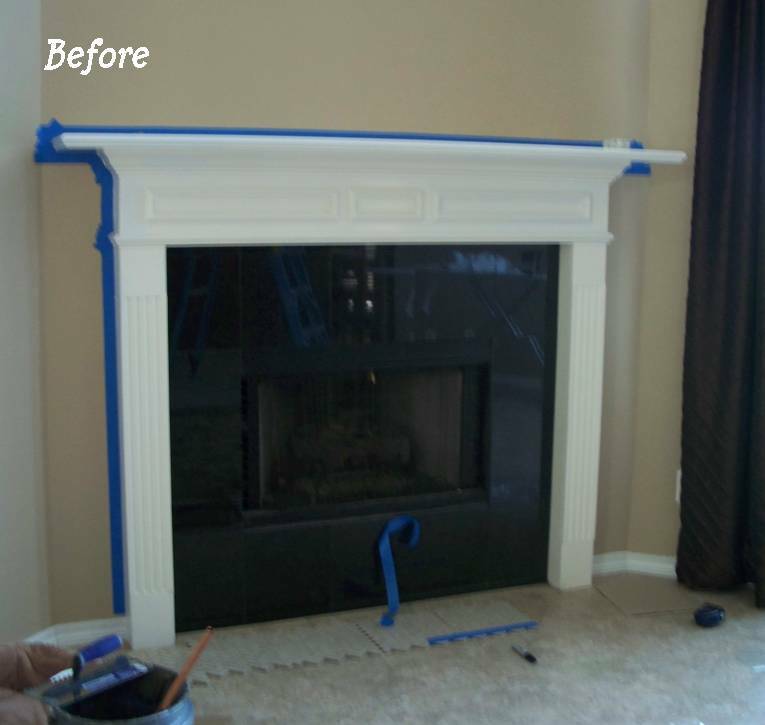 Other than that, the walls always require at least two coats of paint, and it is better to accept before you have to re-tape the trim. Because of this, I always buy the cheapest line of paint possible. 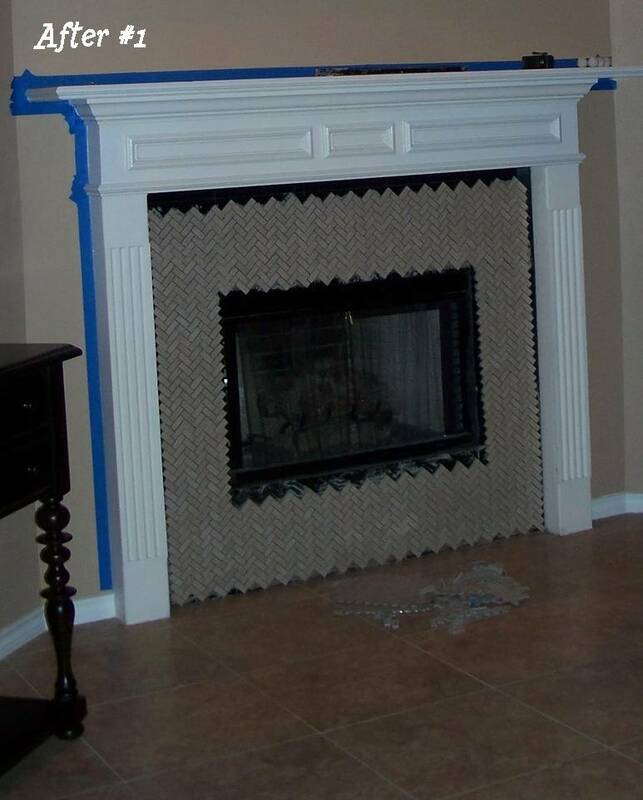 I use Sherwin-Williams paint (my favorite) and I always ask for the cheapest available. Darker colors typically require darker bases and are more expensive, but I have definitely saved a lot of money by going with the cheaper paints when available. Use Primer on trim and doors. This is a new one for me. In our house, the trim and doors are some kind of almond color (ugh). I like bright white trim and doors, especially with colored walls, so we are repainting all of the trim and doors in this house. Before I started to use primer, I had to paint 3-4 coats of glossy white paint to fully cover the yellowish trim. With primer, I get away with one coat of primer, one coat of glossy white paint. That being said, I have found that primer works best to help adhere the high gloss paint to the surfaces and helps cover the almond color with fewer total coats of paint. I use Zinsser Primer. Save some dough, wrap your roller covers! Use plastic wrap (yep! the stuff in your kitchen) to wrap your rollers and brushes if, like me, you take a couple of days off in the middle of our project. You won’t have to clean the rollers (I REFUSE TO DO THIS! Too much work! BLAH!) or the brushes. I only do this as a short term fix, as in a couple of days. 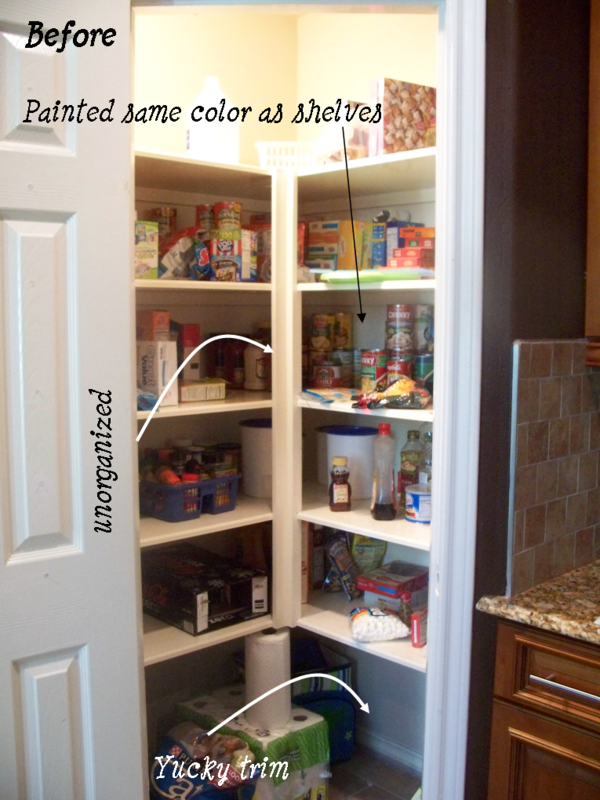 For long term storage, you can also put the wrapped roller cover/paint brush in your freezer. I haven’t had much success with this, but I have heard some people do. Caulk/tape pulls the paint off. Yes, this has happened. Yes, it is extremely annoying. It is most common in corners, where you had to use a little more caulk to prevent the bleed-through. I have learned that it is ok to start painting even while the caulk in the corners is not completely dry. 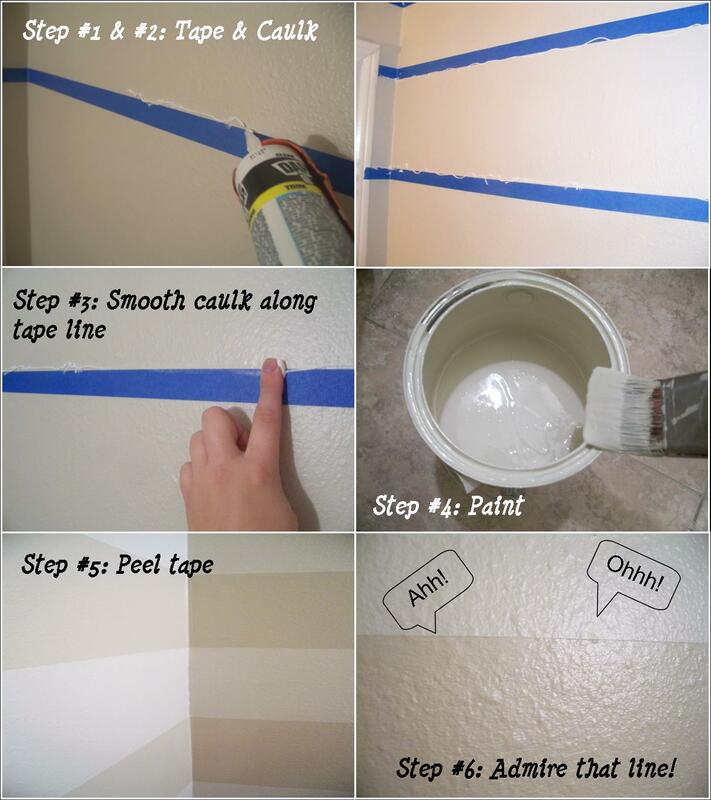 Also, you can use a razor blade to cut along the tape so that the paint on the tape is separated from the paint on the wall. If this still happens, you can always touch up with a small brush by hand. A few touch ups like this are perfectly normal and your end result will still have a ridiculously perfect line. Spray texture in a can peels off. We have had to touch up some spots with that spray texture in a can. It definitely works, however, tape/caulk will peel paint or the texture itself. I simply primer before painting to prevent this issue. I hope this helps at least one person out there who can’t figure out how to prevent bleed-through with tape or how to cut in along the ceiling! I get absolutely furious when I peel the tape only to find that my line is anything but straight! Good luck!!!!! First of all, we are DEFINITELY NOT EXPECTING (sorry, Grandma). Just wanted to clear that up before any rumors or excitement levels were increased to epic proportions. Now that we got that out of the way…. phew. Ok, so in the last 6 months or so, I have been to two baby showers. I have discovered that I have a hidden talent in that I am an awesome diaper-cake-maker. New profession?! Could be. 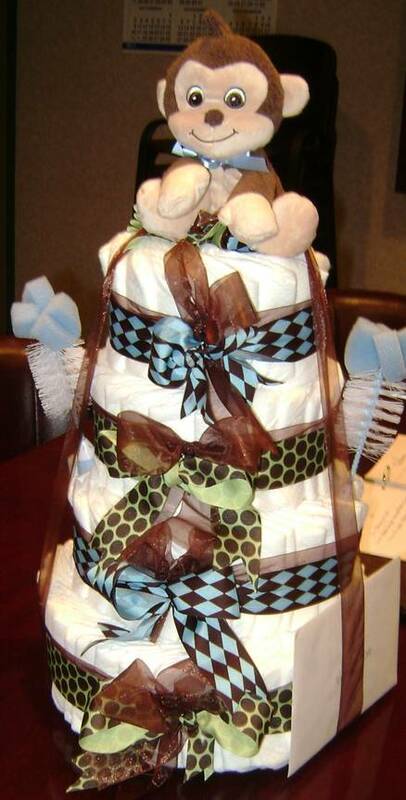 I have always heard people say diaper cakes are soooooooooooo hard. Um, not really. 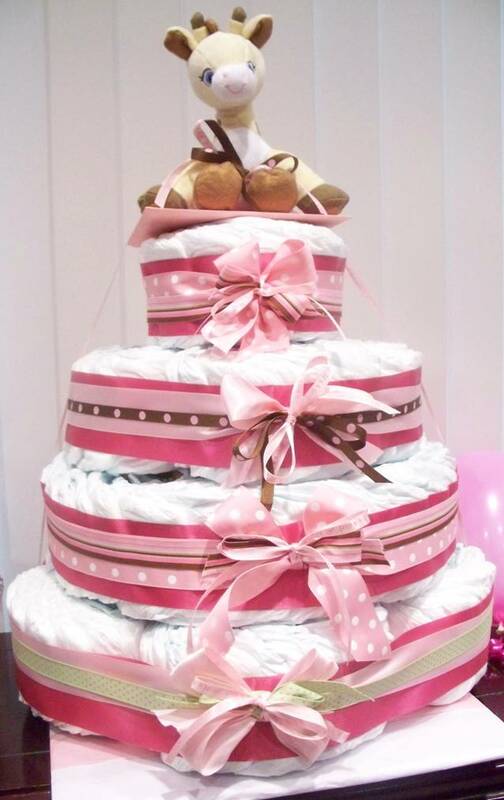 Thanks to Google, I found a cool website that shows an easier way to make a diaper cake. I think this method works much better than rolling each diaper. Plus, the new mom won’t have to un-rubber band (yes, I think I just created a word) each diaper when she actually goes to use them. Functional and pretty! 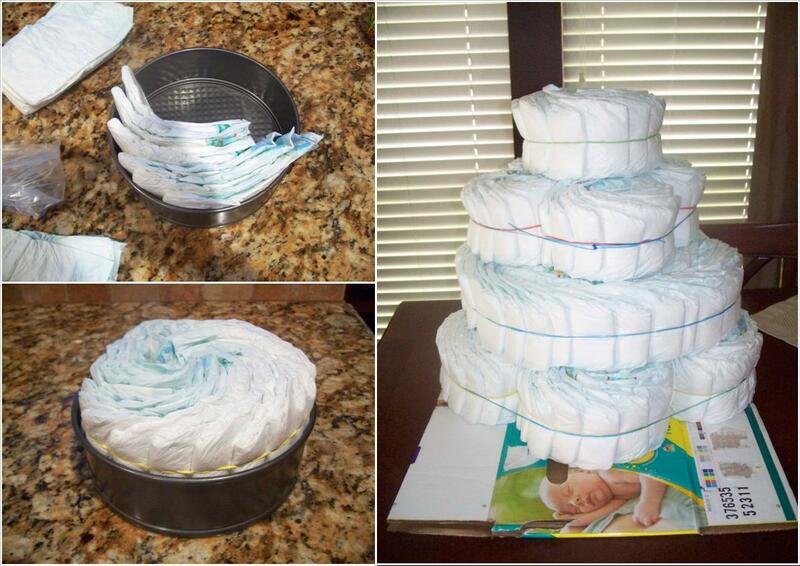 Check out the diaper cake instructions I used here. I made that one with one box of diapers. I used random pie pans, skillets, and cheesecake pans to make the circle sizes. I thought it turned out pretty darn awesome for my first diaper cake! Since another friend is also pregnant, I got to make a second diaper cake for a girl. I decided to use two boxes of diapers this time and went a little crazy. This time, I took some in-progress pictures to show my version of some of the steps. Here is the final product… so stinkin cute if I do say so myself! 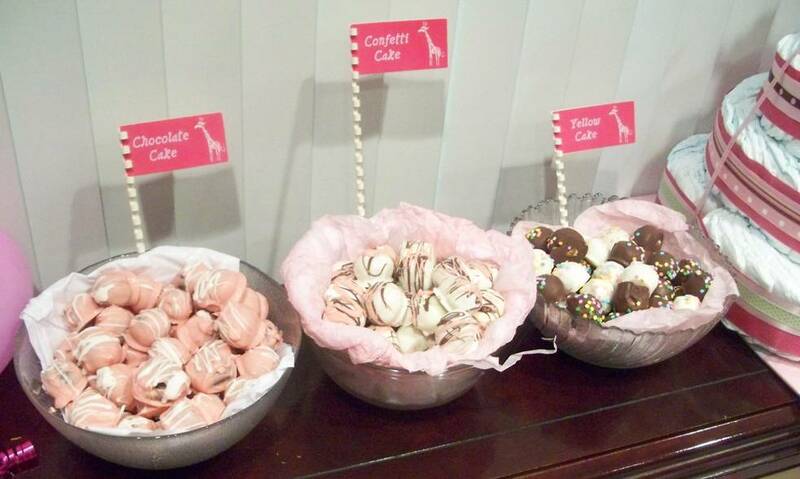 I also made three different flavors of cake balls: confetti cake, yellow cake, and chocolate cake. They were fabulous and everyone loved them. They turned out to be pretty cute too. The yellow cake ones were my favorite! 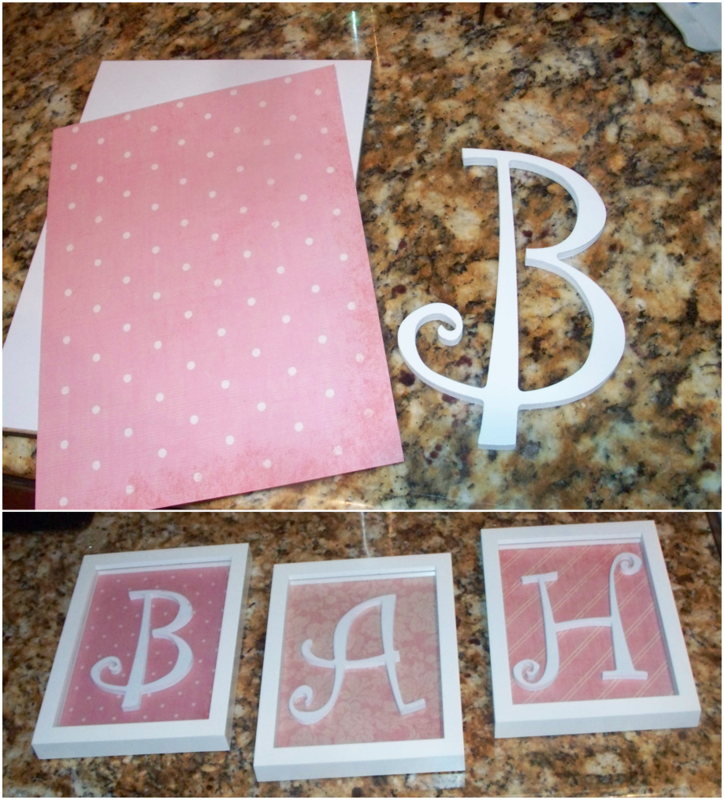 And to get all of this baby stuff out of the way in one post, here is a cute gift that I made for the baby shower. I picked up the letters and paper backing from Hobby Lobby and the frames from Wal-Mart. The letters are about 1/4″ thick. I spray painted them white and hot glued them to the paper. 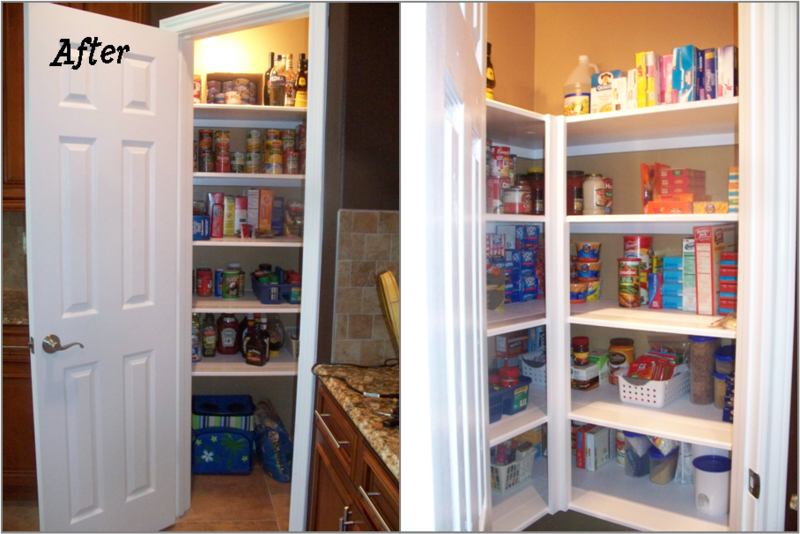 Over the past weekend, I tackled one of the constantly-bugging-me projects: our pantry. 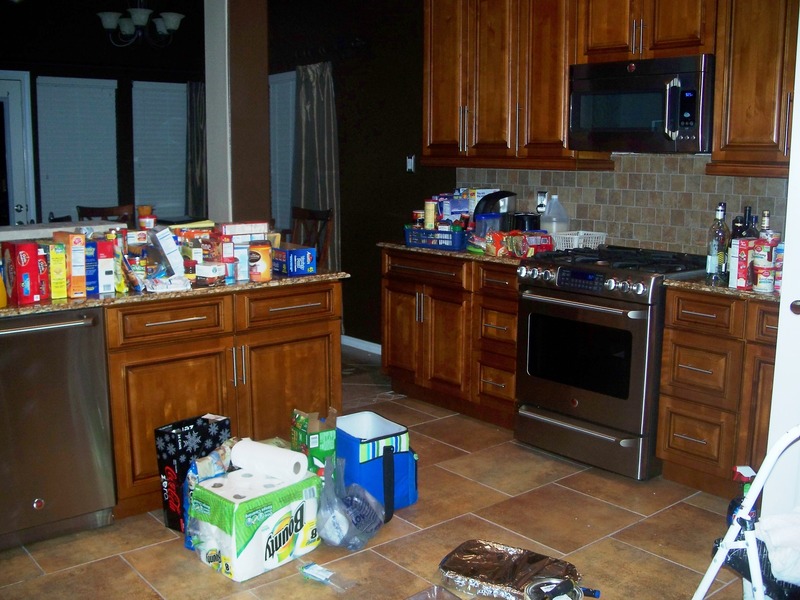 When we remodeled the kitchen here (progress of the remodel, anyways), I didn’t finish the pantry. It didn’t need a lot of work, just paint. The door handle to the pantry has been off since we first started with the kitchen and I finally got tired of seeing it sitting in my catch-all kitchen drawer. I have a lot of leftover paint from the dining room because I was originally going to paint the walls the darker color and the inside of the boxes the lighter color. Convenient that I didn’t have to buy anything to do this project (except a little more primer, always comes in handy though). No, I did not do any awesome stencil job like House of Smiths but I am still happy with my work. The before picture doesn’t look that bad. But what you can’t see is the splashes of what-I-am-assuming-is-food-to-avoid-being-grossed-out on the trim. 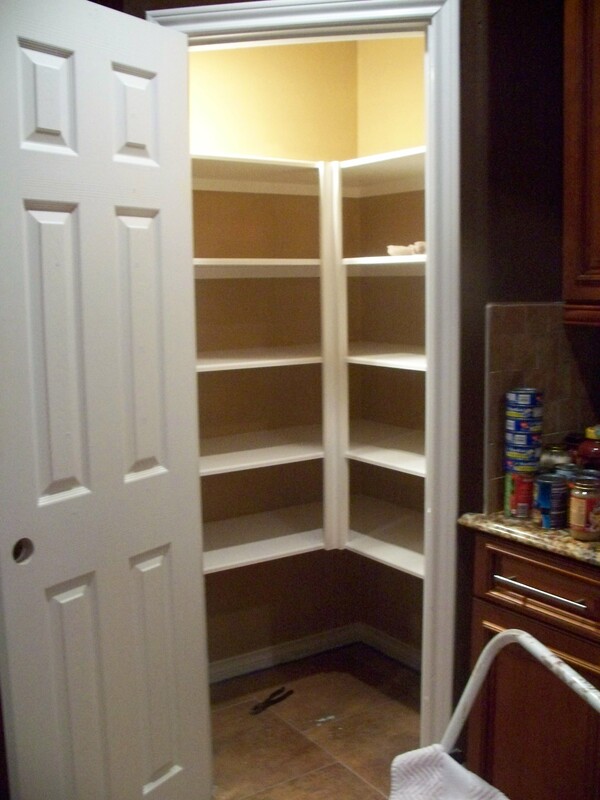 The shelves and door were an awful off-white/yellowish tinted color that I absolutely can’t stand. The door was gross around the handle from sticky fingers, and the shelves were all marked up from sliding stuff on them. Oh, and the closet didn’t have a light before. 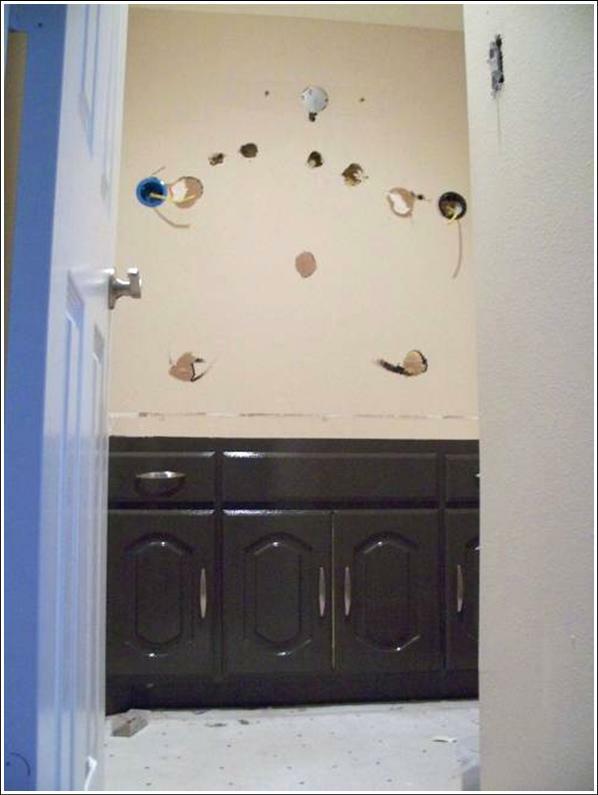 Aaron installed that when we remodeled the kitchen. So it was a dungeon before. This is what happens to your kitchen when your pantry is under construction… there was not a single square foot of usable counter space all weekend (which = NO COOKING! oh wait, I don’t cook anyway). To avoid scuffing up my amazing shelf paint job, I bought bright white rubber matting (fairly thin stuff) from Lowe’s. About $14 (one BIG roll) was enough for all of my shelves. Martha would be proud (maybe). I feel so organized. I am ready to begin crazy couponing! Anyone who knows us, knows that we aren’t just about DIY home stuff, we do almost all of our own car work (repair, upgrades, etc. too). As with the house, we mostly do this because we are cheap. Another reason is that we have trust issues letting other people work on our stuff. And no, we are not going to work on that. 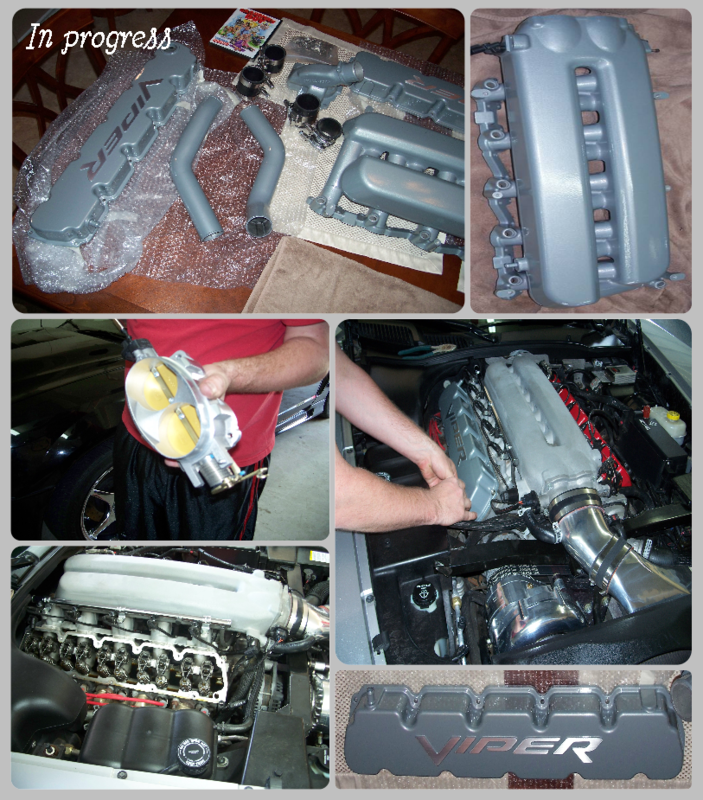 About a month after we got married, we bought the Viper from a private person (not a dealer) in Oklahoma City. I guess you could consider our turn around drive to pick it up our honeymoon??? 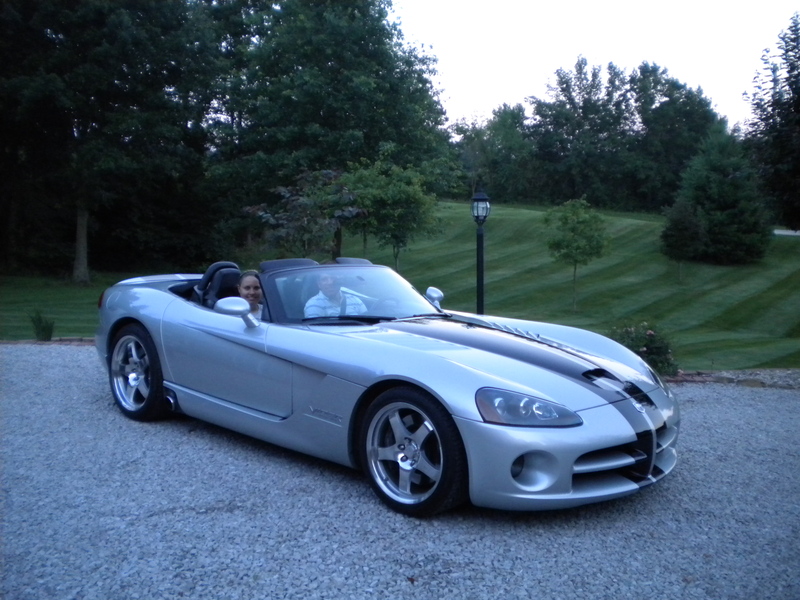 It isn’t like the car needed repaired or even upgraded, it’s a stunning beast on its own. 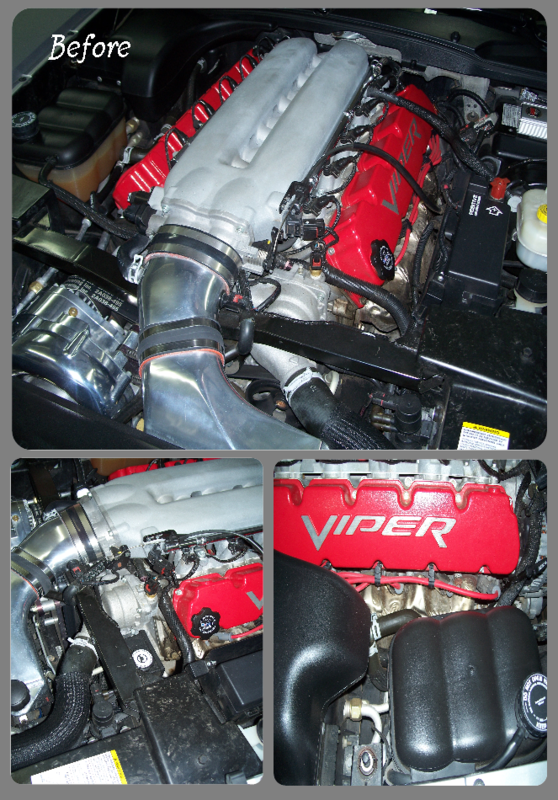 Mostly because of its Paxton friend that resides under the hood. Houston has some amazing car clubs. 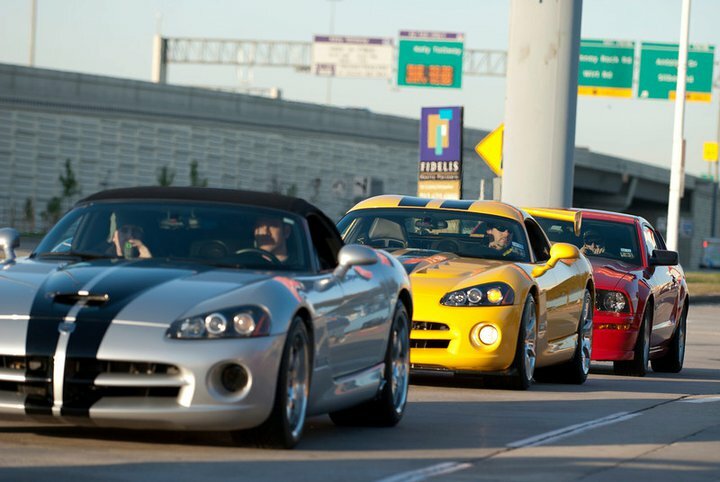 This picture was taken by someone (soooooo sorry, I don’t know who took this or I would give credit) at Houston’s Coffee and Cars (http://coffeeandcarshouston.com/) January 2011 event. I want this guy’s camera! That is Aaron driving and his best friend Rob in the passenger seat. Naturally, we looked in Lowes and Home Depot for a good starting point on vessel bowl prices. We found one that we liked on Ebay for $45 that was 18″. 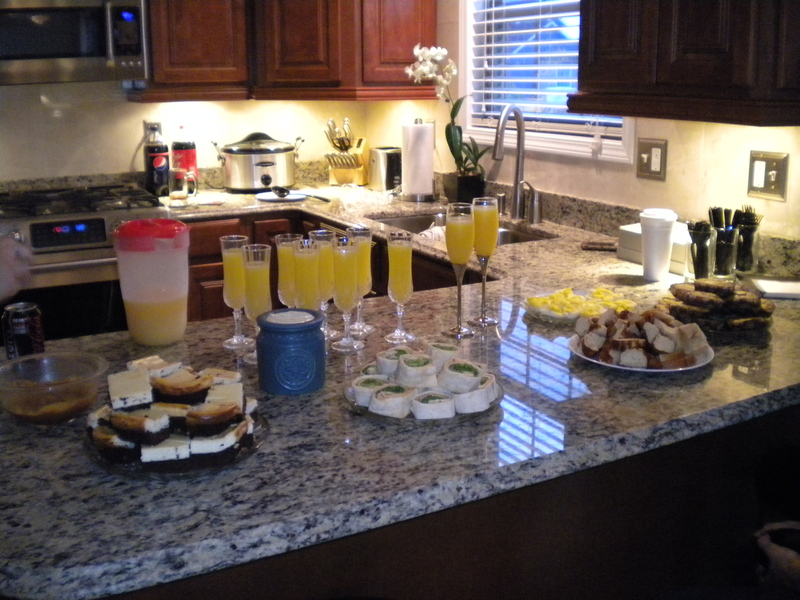 We planned the faucet and bowl sink holes out for this arrangement and the marble top had been drilled for this setup. Then the box arrived and the sink was in a million pieces. What a sad day. We decided to buy the in-stock Lowes white vessel bowl. The box said 16″ so we thought it might work. Turns out by 16″, the company means 15.5″. The faucet wouldn’t quite reach. That bowl was returned. The search continued. 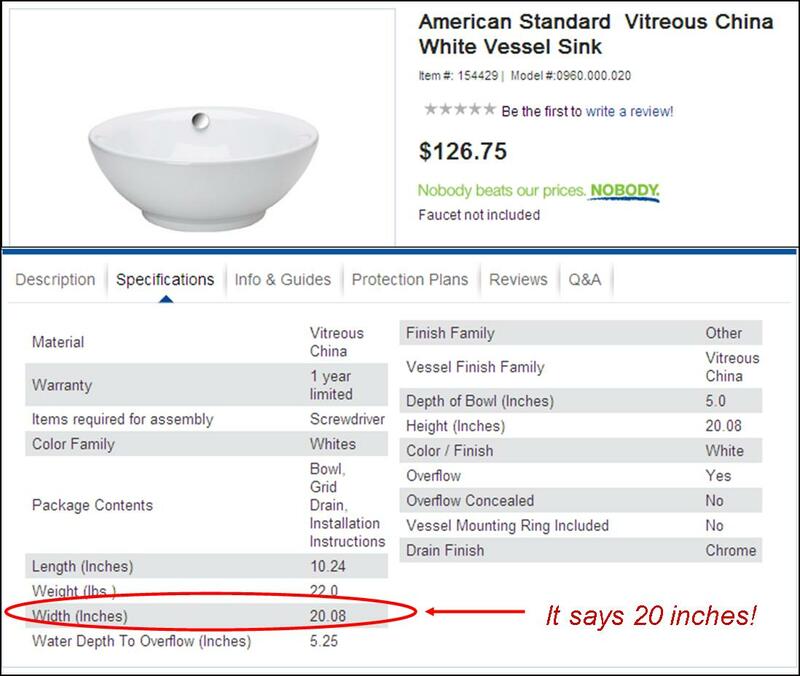 On Lowes’ website, there was an American Standard vessel bowl that SAYS it is 20″ in diameter. SEE?????? 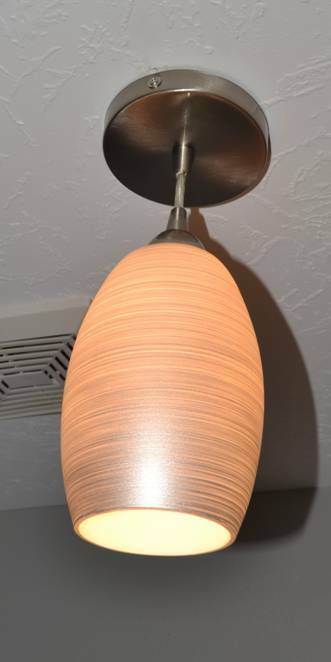 This was a special order item and we even verified when we ordered it that it was 20″. It took a couple of weeks to be shipped to the store. I went to pick up the sink after it finally arrived, got it home, and guess what… it’s a 17″ sink! 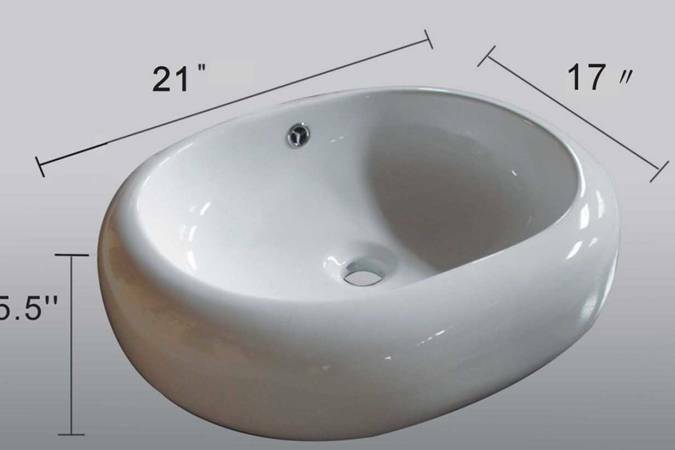 So I googled the Model number and all other websites that sell this sink say that it is a 17″ sink! (And by 17″, they really mean 16 3/4″… again… what is with these measurements!?!?!). Back to the store AGAIN to return this sink. By this point, Aaron and I are so disappointed and frustrated with this whole vessel sink process. The search for a vessel sink resumed and Ebay was our number one starting point. Finally, Aaron found this sink and for $69 buy it now with free shipping! As long as it comes in one piece (FINGERS CROSSED!) we will finally have a working sink. Lessons learned: Ebay is awesome (duh!) and things work out for the best. I like this last sink the best, and if all goes well, it will hopefully be the last vessel sink we have to buy for this bathroom! And if you look closely, you can see that there are two pieces of trim. 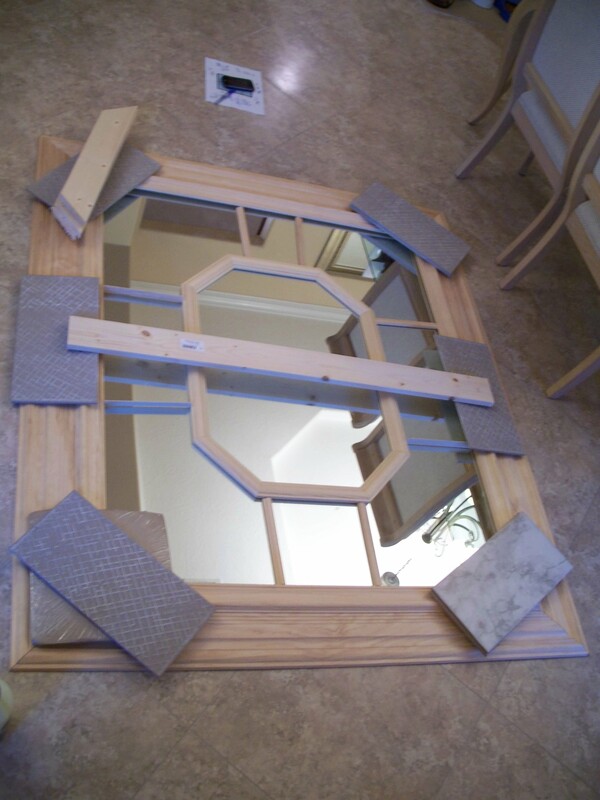 The larger floor trim butts up next to the mirror and the extra piece overlaps both the mirror and the floor trim. 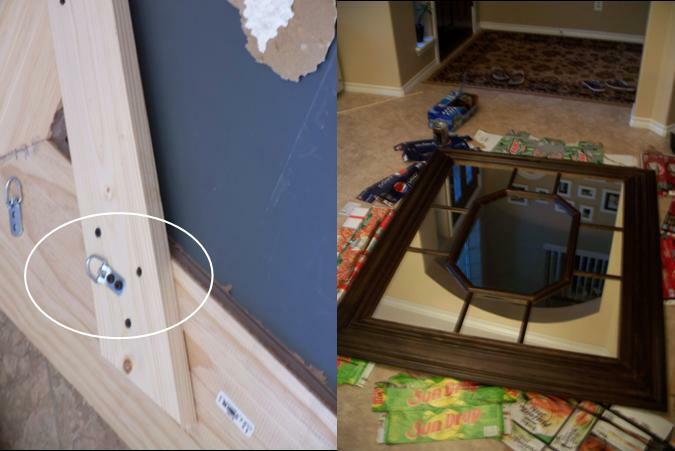 After dry fitting everything, we hot glued and stapled each of the frames and then screwed and hot glued the overlapping frame to the large floor trim frame from the back. 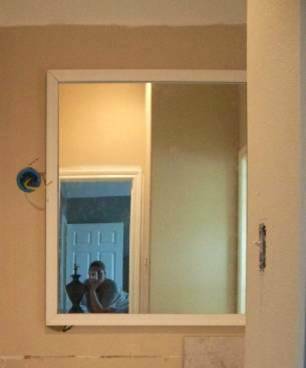 Next, we flipped the frame contraption over (face side to the floor) and added some mirror mastic (available in a caulk tube in the mirror section of Home Depot/Lowes) to the outer edge and set the mirror in place. We also added some “just in case” supports on the back corners. We attached these to the frame with screws from the back. Next, we cut the center pieces. 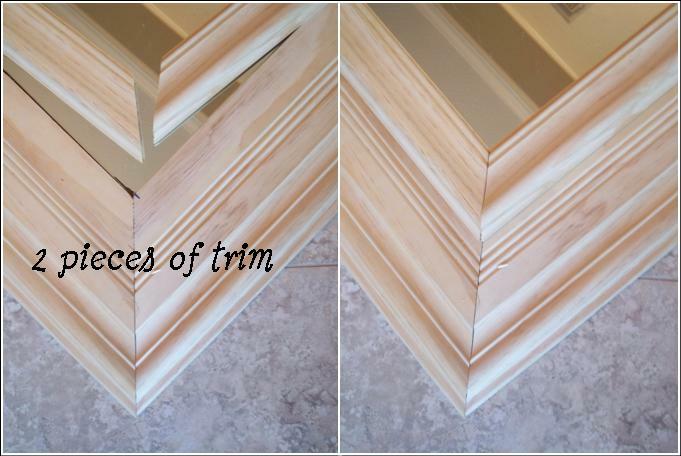 These are just smaller pieces of trim. The hexagon-type shape was very easy. The angles are 22.5* (1/2 of a 45* angle). Also, the pieces can be any size, as long as the piece opposite is the exact same (not sure if that makes sense or not). Here is the shape we were going for. The boards and tiles are to hold everything flat while the mastic/glue dries. 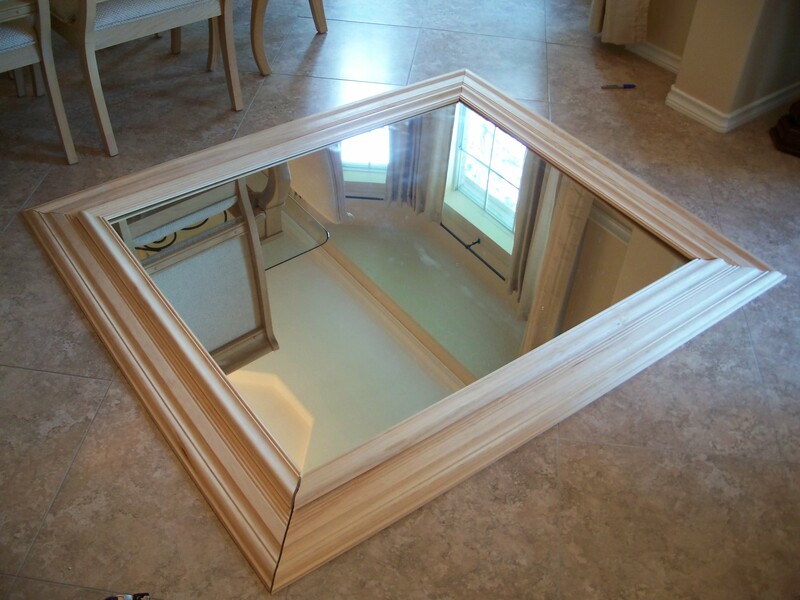 The mirror itself was 55″ by 42″. Add some trim to that and it became very heavy, and even bigger. We used the hooks above (circled), but realized they didn’t quite hold it like they should. We bought the picture hanging wire (heaviest available) and wrapped it through the hooks and the support boards. To hang it on the wall, we used a very large leg bolt (not sure if that is the correct terminology or not) and some washers. And here is the final product! In total, this project cost about $100 because of the stain grade wood. It can definitely be done on a smaller budget. We have 4 more mirrors left… let’s see what we can do with those!